Who is taking care of the public interest? Are you concerned that the public interest (the welfare and wellbeing of the whole population) is being ignored by successive governments? Does government seem more focused on internal politics and vested interests than the common good? If you answered yes, then this collection of short sharp essays by 39 leading Australian thinkers and agents of change is for you. Other topics include climate and the environment, refugees and asylum seekers, mental health, early childcare, inequality and new forms of democratic engagement. We are grateful to the Social Justice Fund, which provided financial support to cover part of the costs of this publication. We'd love it if you bought a copy - easier for you to read and to show it to others and the proceeds help to cover the cost of this publication and support our future work in the area of public interest. 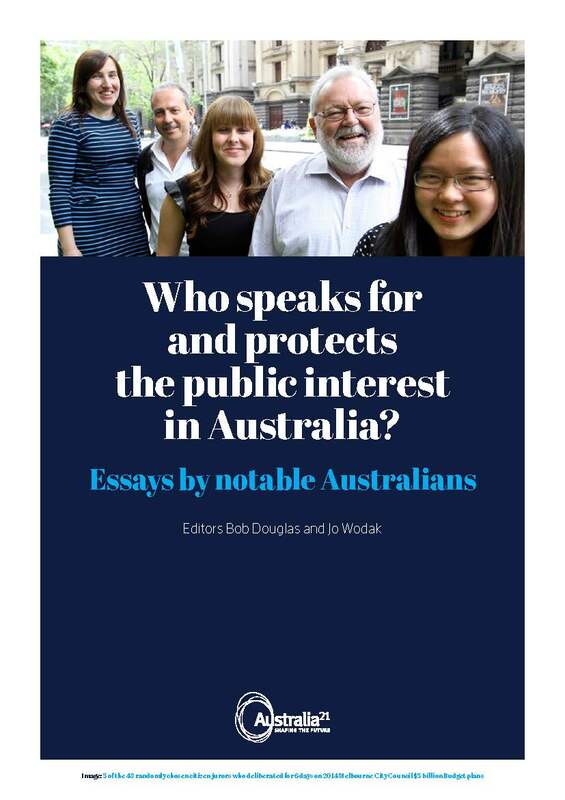 If you prefer a download please click on the cover above or the title here Who speaks for and protects the public interest in Australia? Excepts from "Who speaks for and protects the public interest in Australia?" John Menadue AO, former head of Qantas, News L td and Secretary of the Prime Minister's Department to both Gough Whitlam and Malcolm Fraser: "The problem is urgent....There are many key public issues that we must address. They include climate change, growing inequality, tax avoidance, budget repair, an ageing population, lifting our productivity and our treatment of asylum seekers. But our capacity to address these hard issues is becoming very difficult because of the ability of vested interests with their lobbying power to influence governments in a quite disproportionate way." Amanda Tattersall, founding director of the Sydney Alliance: "In the wake of the Second World War, Karl Polanyi wrote that the public arena is made up of three interconnected sectors: the market, government and civil society. He argued that democracy thrives when these three are in balance. If only that were the case today. Since the late 1980s, the global influence of the market sector has increased and, at the same time, civil society has decreased. This can be felt every day in Australia’s cities. We see it in declining investment in community infrastructure — everything from a lack of public transport to unaffordable housing. First in Sydney, then in other Australian cities, as well as across the world, civil society organisations, like churches, schools, unions, community and religious organisations, are rebuilding the power of civil society using community organising - a way of working that trains and builds citizen leaders inside community-based organisations. Community organisers argue that in order to fix our cities we need to fix our democracy. That means we need to build strong and vibrant civil society organisations that act for the common good. Patrick Dodson, Indigenous leader: "As a nation we have not engaged in a meaningful dialogue about Australia’s colonial past and its ongoing legacy in a way that enables us to move beyond the politics of blame and guilt. We seem to spend a lot of negative energy caught up in false binaries around white guilt and black victimhood, white blindfolds and black armbands, collective rights versus individual responsibility, symbolic reconciliation versus practical reconciliation, the Left versus the Right, and so on. The outcome of this dissonance is policy that responds to ideology and ingrained prejudice rather than the needs or aspirations of those to whom it is directed. Joyce Chia, refugee and asylum law specialist: "It has been said many times that Australia’s unusually cruel refugee policies reflect its peculiar history, geography and public attitudes. True enough, but it is not the whole story. For Australia’s refugee policies also reflect its politics — and, in particular, its weak commitment to the ‘liberal’ part of liberal democracy. This is the part that’s designed to ensure that the principle of ‘majority rules’ doesn’t end up trampling the rights of minorities."